Barista competitors quickly picked up on the benefits of a grind on demand grinder - not only for the extra flauour of the freshest ground coffee, bat also the aduantage of repeatability of dose with minimal waste. Walk into almost any specialty coffee cafe, and you will see a gaggle of these grinders lined up next to the espresso machine. There are many grind on demand grinders available on the market, but they are not all the same. In preparing for the 2012 World Barista Championships, I had the opportunity to get to know and make good friends with the Compak K10 Fresh grinder, and here are some of my thoughts. The Compak K10 Fresh is a large blade conical burr grinder. After a lot of experimentation and cupping with grinder shootout style comparisons, I have developed a strong preference for conical burr grinders for espresso. My experience comparing flat and conical burr grinders is that the espresso flavour from a conical is consistently more complex and deep in both flavour and structure, compared to the same coffee in a flat burr. From a practical point, conical burr grinders have a larger window of adjustment when you are at or near the perfect grind size, while flat burr have a very narrow window between too fast, too slow and just right. The large burr size provides the best chance of minimising heat build-up in the grinds over busy times (friction is unavoidable in the process of grinding, and this contributes to heat build-up over sustained peak periods). This grinder, as has become the current practice in serious high-end espresso grinders, includes a fan to circulate fresh air within the grinder body and assist in keeping temperatures more stable. While I have heard many anecdotes of clumping with this grinder, my experience has shown it provides a nice fluffy grind with a fantastically clean dose of coffee that falls straight into the handle with very little spill, spray or static ... meaning all the coffee ends up in the handle, not on the bench. THIS IS A FANTASTIC GRINDER. IN THE IMPORTANT AREAS OF GRIND, DOSE CONSISTENCY AND QUALITY OF ESPRESSO FLAVOUR, THE COMPAK K10 FRESH STANDS EQUAL WITH ANY COMPARABLE CONICAL BURR GRINDER. The Compak K10 Fresh is one of the most consistent grind on demand grinders I have used. Over 15 handles, the weight variation was +/- 0.3 of a gram. which is very good, and from my experience provides a stable and predictable flavour and shot behaviour from each handle. The grind time for me sits between 4.9 and 5.6 s from 18 g to 23 g dose (which is the range I normally sit). This is not the fastest grinder I have used, but it is only around 1 s per handle slower, and I think this slightly slower time assists in the tight dose variation seen from this grinder. This grinder uses a knob on the side for refinement and has a continual variable adjustment acting on the blade, with a worm gear allowing for an effortless and extremely precise grind. The grind setting is indicated with a scale on the LCD screen. 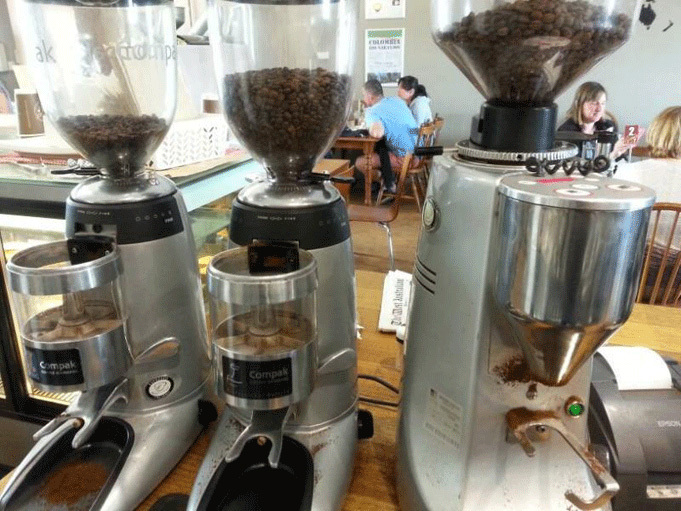 On the Compak K10 Fresh, the dose is adjusted by the simple process of altering the grind time. Press the desired dose button (single handle or double handle), scroll through the time positions from left to right, then use the plus or minus button to increase/decrease. There is no need to hold anything down or wait for flashing etc. Grind time can be changed very quickly. The throat only holds around 1 handle worth of grinds, so grind change requires very little purge. The K10 Fresh is an easy to use grinder. The handle is at a good height, and the screen and all the buttons are easy to see and use. The conical burrs give outstanding espresso characteristics and consistency of dose weight for each shot. Every shot is very clean and delivers straight into the handle. It's quick and easy to change the grind adjustment and time. The tall/narrow bean hopper also gives a consistent dose until very close to empty. I have left this until last, because while this grinder is not an ugly duckling, it is not the prettiest grinder I have seen. Having said that, it is also the least important feature of a grinder in my opinion, and the excellent qualities outlined above make this grinder an outstanding choice if consistency and quality of extraction are important to you. This is a fantastic grinder. In the important areas of grind, dose consistency and quality of espresso flavour, the Compak K10 Fresh stands equal with any comparable conical burr grinder. The Compak K10 Fresh's price point also makes it outstanding value for money. The COMPAK K10 FRESH offers a number of state of the art features, including: 3 different operating modes, electronic display and a step-less grind adjustment. The three grinding modes (automatic, manual and two programmed timed shots) are monitored and adjusted by the electronic display, allowing you to pre-set the coffee dose down to a tenth of a second. This gives the barista the ability to reproduce the perfect shot time and time again.